I’m by no means the first to pull the BMW 6 speed swap, but it’s not nearly as common as say the 2ZZ-GE swap into an MR2 Spyder. Why do this? The general consensus is that the 6-speed box out of the M3 is smoother shifting. The stock 5-speed in the M Coupe has no overdrive, 5th gear is a 1:1. Everything stock, not such an issue. 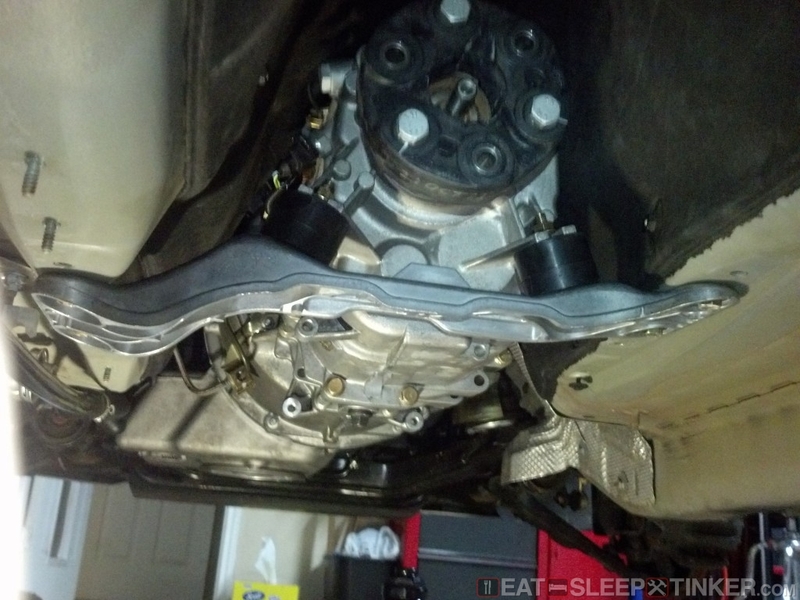 BMW installed an incredibly tall geared differential in the M Coupes (lower numerically.) 3.15 to be precise when talking S54 flavor (’01-’02.) Meanwhile, the M3 (with an identical engine) received much lower gearing (~3.64 if my memory serves me.) Of course some of this balances out with the rolling diameters (17″ vs 18-19″ wheels.) But it’s just another handicap to the M Coupe, much like the lowered rev-limiter. I’m thinking Big BMW didn’t want the red-headed M Coupe outshining its perennial performer and cash cow, the M3. So, if you plan to go the poor-man’s supercharger route and drop a lower gear rear-end in your Coupe, then you have to contend with increased RPMs at cruise. The answer: overdrive. The E46 M3 box’s 1-5 ratios are identical to the E36’s, but with the addition of the overdrive at 6. 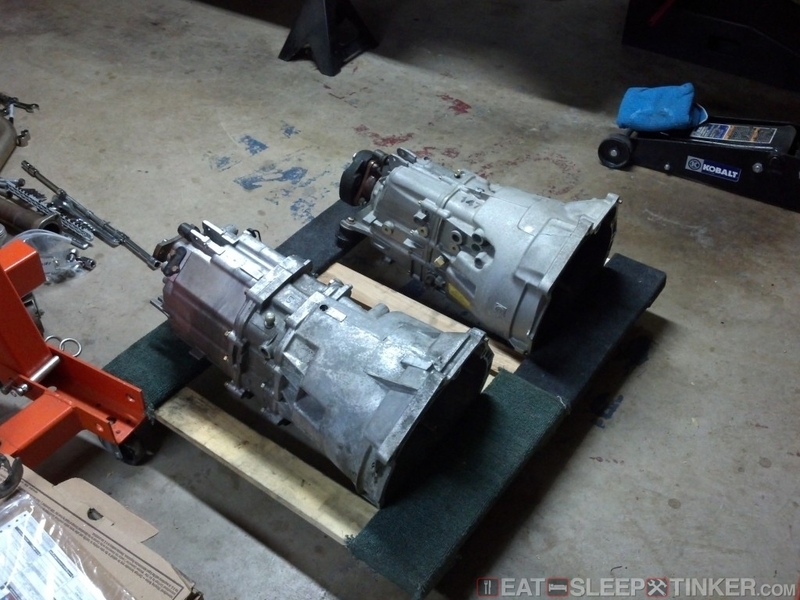 Longer 6 speed from an E46 M3 on left, 5 speed from an E36/8 M Coupe on the right. Now the more popular swap seems to be the E36 M3 Evo 6-speed. The reasoning: it shares all the clutch/flywheel parts with the Z3M’s. The major hang up with going this route; M3 Evos were never offered in North America. So, if you wish to go this route, then you must hunt one down from Europe and pay the shipping stateside. 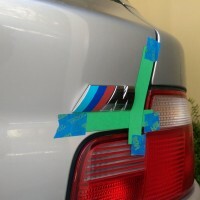 Many have done this, but the E46 M3 is a more plentiful option. I picked mine up off of a Car-Parts.com, had it freight shipped on a pallet. Just look for the lowest mileage you can find, make sure you don’t get an SMG box. 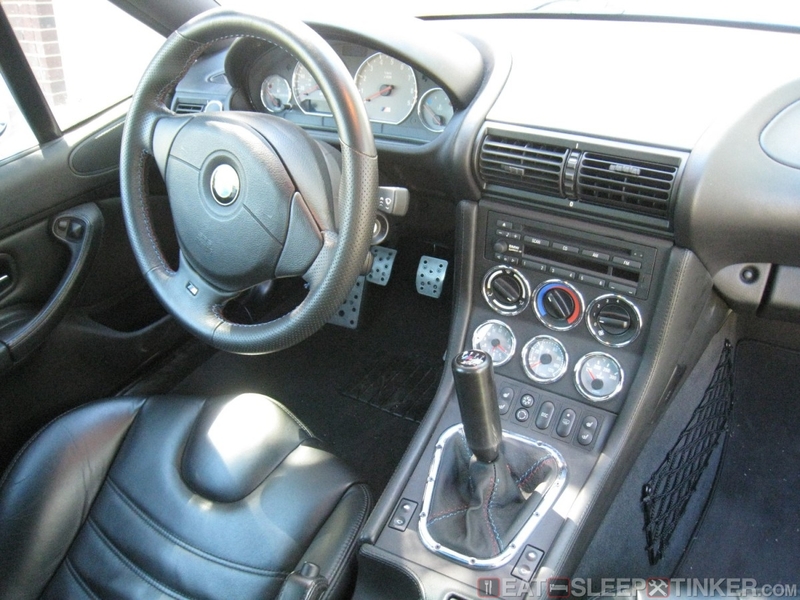 The E46 M3 6 Speed looks nearly identical to the 5-speed. I won’t cover the in’s and out’s of R&R‘ing a transmission. Bottomline: it’s a bear. 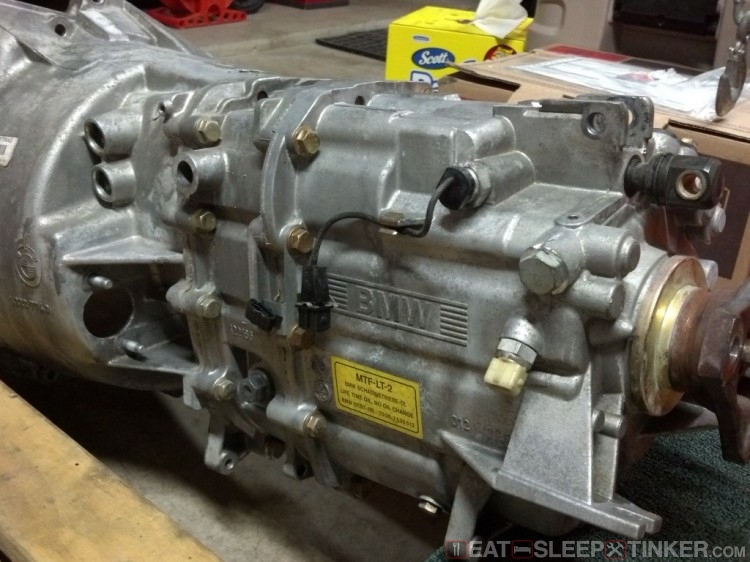 Look here for a pretty in-depth guide: Z3 Transmission Removal (Clutch DIY). Other items you’ll need, since you are using an E46 box: E46 M3 Clutch, flywheel, pilot bearing. Bimmerzone had by far the best prices. 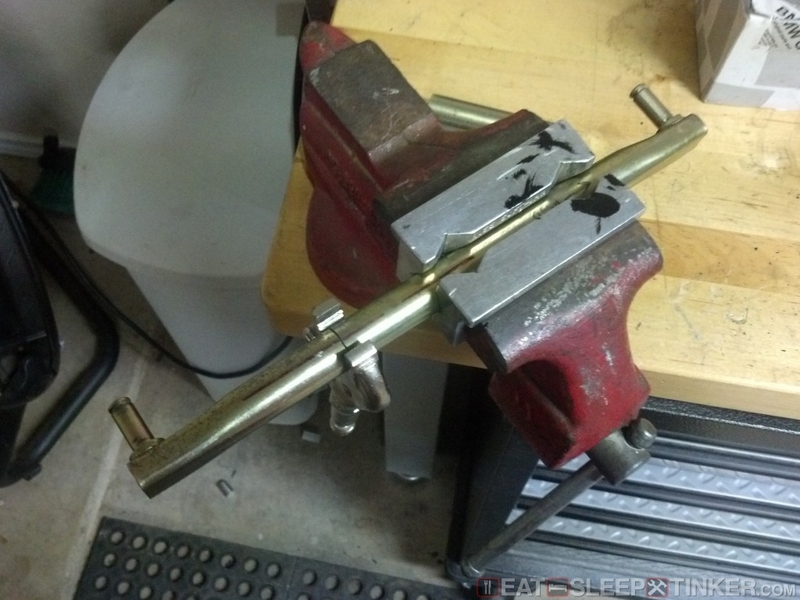 At first I picked up a couple used pieces from the M3 forums, but my pessimism prevailed and I went with new parts. Glad I did, as R&R‘ing a gearbox in this car is quite the chore. You’ll also need a 6-speed crossmember from an E36 Evo (PN: 23702227892), fortunately they are readily available new and cheap. That and the necessary bolts for the flywheel/clutch are all you need to purchase new. Of course I would highly recommend taking care of the flex joint (giubo) during this job, as well as the shifter bushing (I went with RE Delrin bits.) 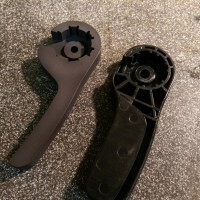 While you’re at it, might as well change out those sloppy hourglass rubber transmission mounts. I went with Rogue mounts, which are still rubber isolators, but a cylindrical shape for reduced movement. 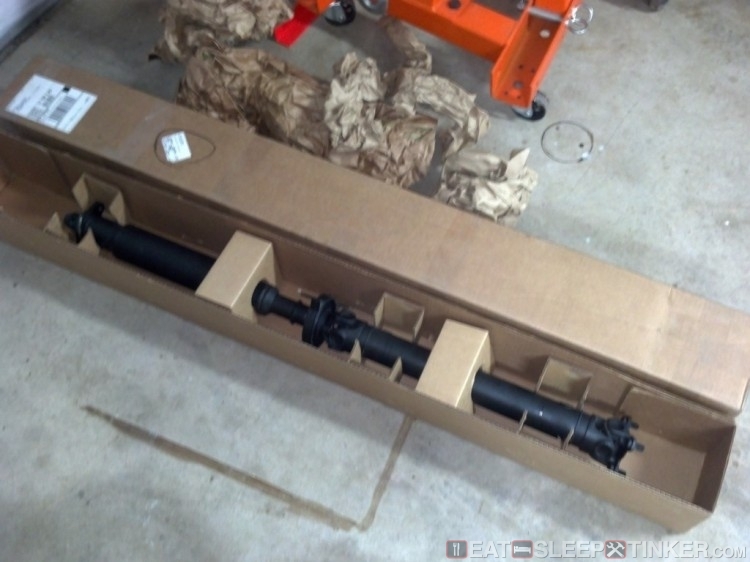 Update 20150722: According to this post over at BimmerForums, the forward half of E36 M3 automatic driveshaft is the proper length for this swap. This will surely cut down on the cost of the swap. 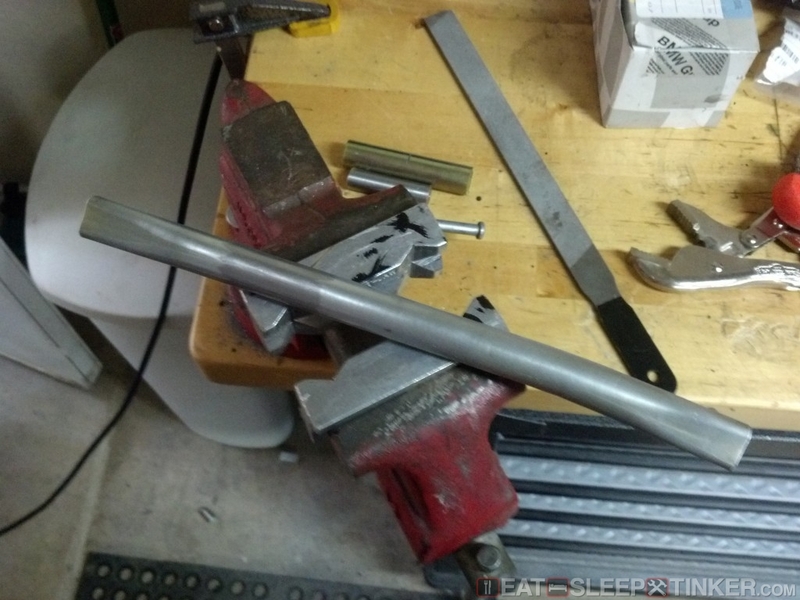 Steel rod machined to fit and inserted. 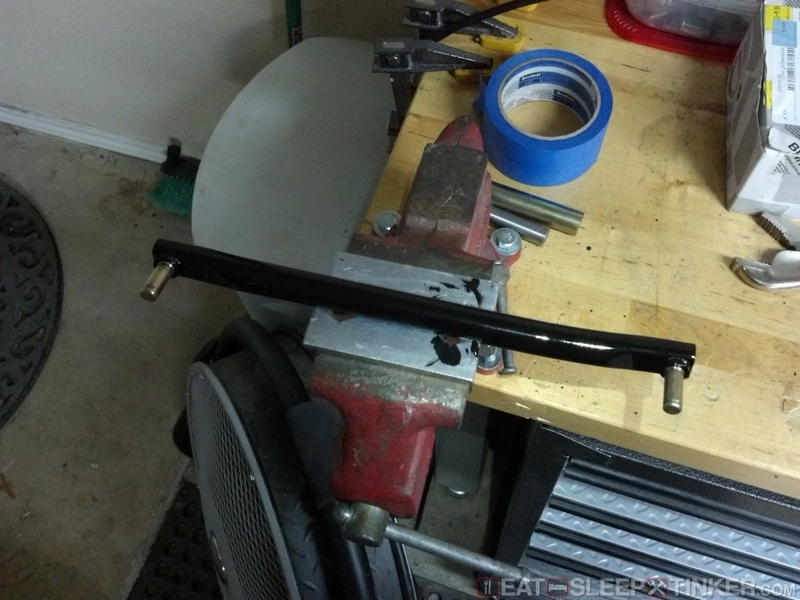 The solid rod was cut to size and inserted inside and between my two remaining shifter rods. 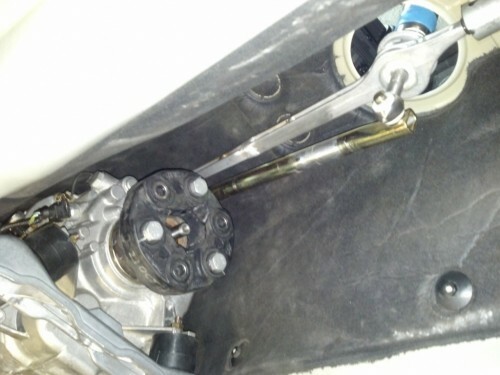 NOTE: The stock shifter rod has a very slight twist to it to exactly center the shift knob. This twist is hardly noticeable with the naked eye, but it’s there. So rather than welding the rod on the bench and just eyeballing the alignment, I installed the rod in the car first. 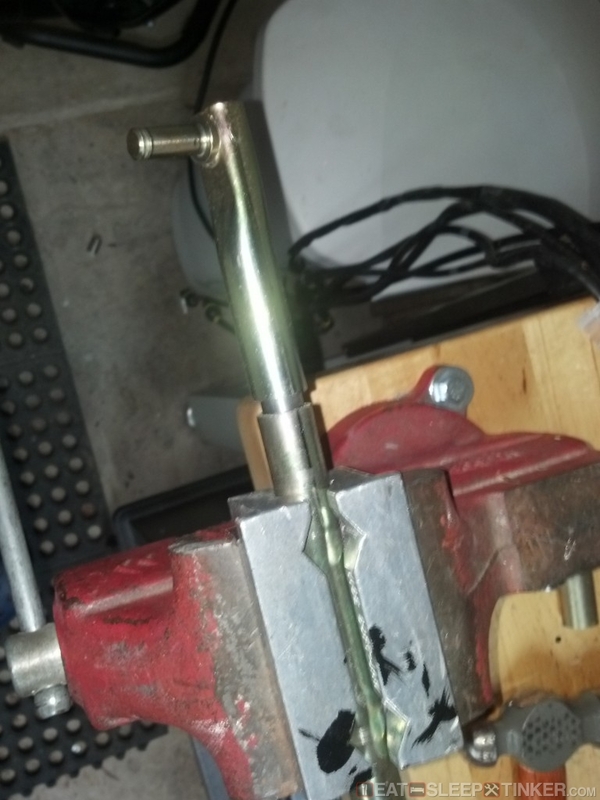 I used a pair of Vise-Grips to hold it steady, making sure the shift knob was perfectly centered. Once I was satisfied, I removed it again and burned the pieces together. Some hand filing left it looking like one solid piece, which I suppose it technically is. Gave it a coat of black enamel, then in it went. UPDATE: I ended up removing the RE short shift and ZHP knob. I liked the weight and feel of the combination, but it was simply too low for me. 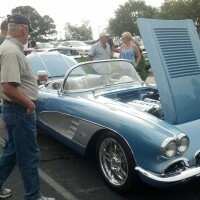 My elbow would interfere with the center console, making shifts difficult. 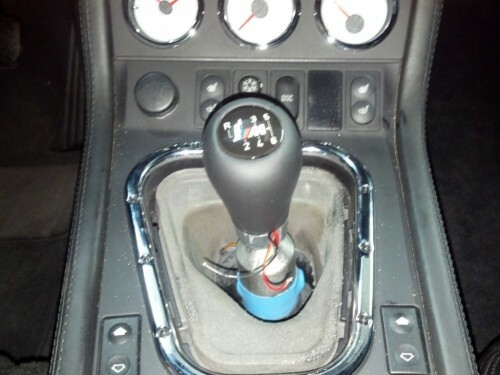 I ended up reinstalling the stock shifter and getting a tall Delrin knob, which is a much better combination. The stock Z3M shifter is already a “short” shifter compared to the normal E36 shifter, in fact many folks use it as an upgrade. 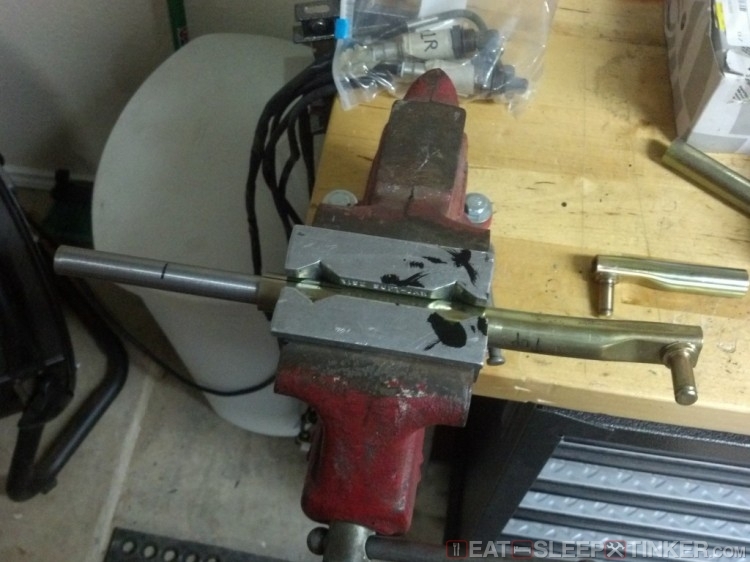 UPDATE: See this post for my custom made Delrin shifter knob. Here the industrial uses of rubber products can be seen easily.